This disc was auctioned on eBay in May 2004. The mix must be the standard mono mix. GIGA RARE UK ACETATE 10!!! Here's a mega rare item for all Beatles fans! !UK 10"acetate copy of "Bungallow Bill" in EX- condition with VERY light surface marks..This is a different take that the offical release! !Chances of finding this gem are VERY slim,especially in such a nice shape...!! The disc was acutioned again in September 2005 by Rockaway Records. That auction provided a few more details. 1968 UK one-sided metal acetate of mono version of song from the "White Album". Same as issued version except it is approximately 25 seconds shorter due to a fade-out at the end. It was auctioned again in December 2005 by It's Only Rock n Roll . 1968. 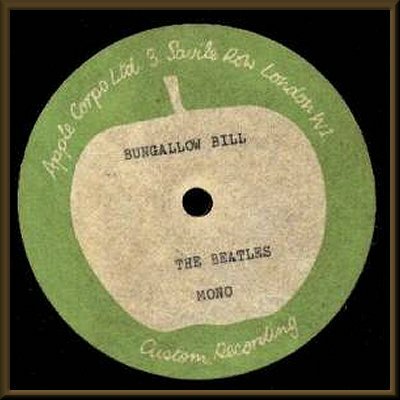 (Apple) Very rare UK one-sided 10" metal acetate of mono version of "The Continuing Story Of Bungalow Bill" from the "White Album". It is the same recording as the LP track except it is approximately 25 seconds shorter due to a fade-out at the end. 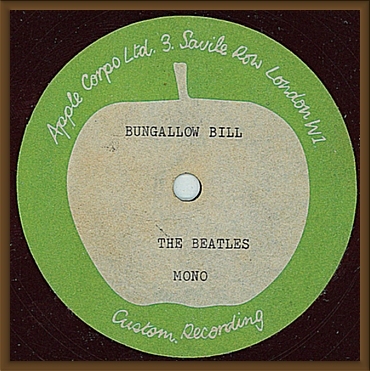 Title is typed on the label as "Bungallow Bill".